Team #SaveCCP hasn't added a story. 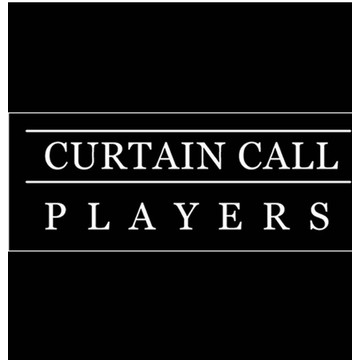 Curtain Call Players (CCP) is a Toronto charity that performs 2 Musicals out of Fairview Mall Library Theatre each year. We provide quality community theatre and do everything we can to keep it affordable to all members of the community …and we’ve been doing it for 40 years! It broke our heart this spring when “The show couldn’t go on.” With expenses rising, our Executive Team searched for creative new ways to keep costs down. This page is our way of reaching out to ask for your help to #SaveCCP. We understand you might be torn between wanting to help, and not wanting to throw hard-earned dollars toward a group you fear might not succeed, so we came up with a risk-free way for you to help! 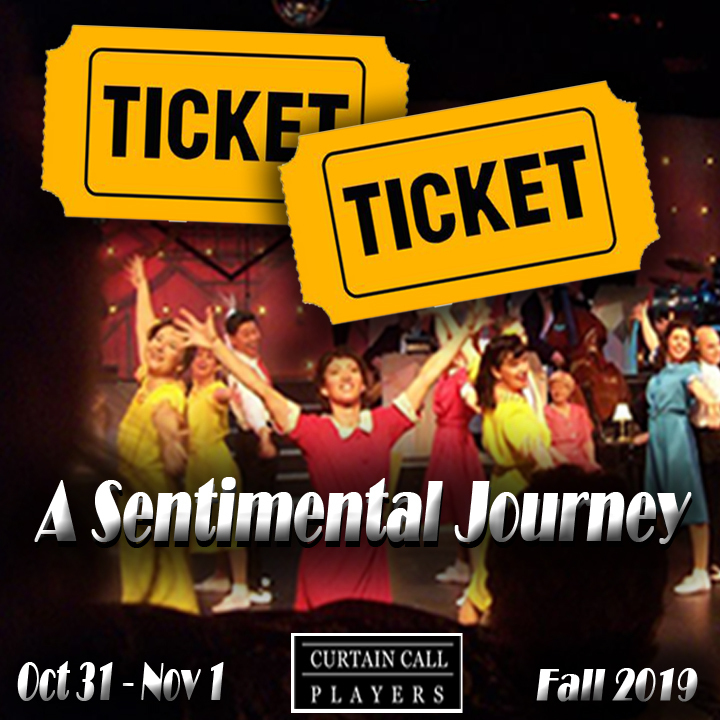 Through crowdfunding, our goal is to raise $29,800, to revive a Curtain Call Players' Classic this fall called A Sentimental Journey. If we don’t make our goal, you don’t pay. We hope that won't happen because we wouldn't want you to miss out on seeing this spectacular show! This WWII Big Band Musical was written by two long-time Curtain Call Players members and was performed to sold-out audiences in 2003 and again in 2005! Toes will tap and tears will flow as the cast tells a beautiful love story through authentic letters sent by Canadian soldiers and their loved ones during WWII. It salutes not only those who went to war, but those who kept things going here at home. We’ve had a blast creating these incentives to share with our CCP supporters and are thrilled at the prospect of bringing this mind-blowing Musical back to life. 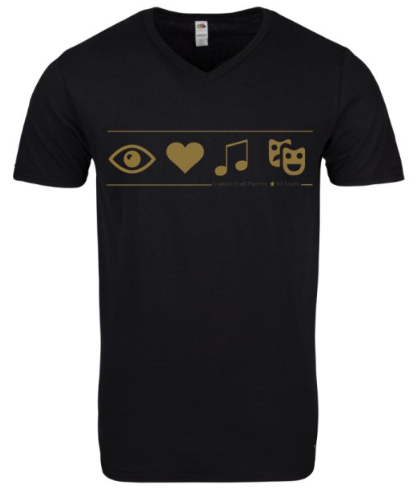 If you wish to pledge an amount and forgo incentives click here and select "Or simply contribute"
I HEART MUSICAL THEATRE: Black T-shirt with a pictogram code telling the world you love Musical Theatre. We really really do! 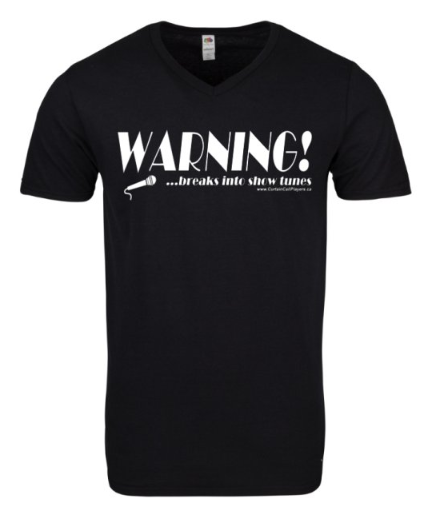 WARNING: The perfect gift with a valuable WARNING for those who live and work around this person. You'd be surprised who will sing along when you break into song! 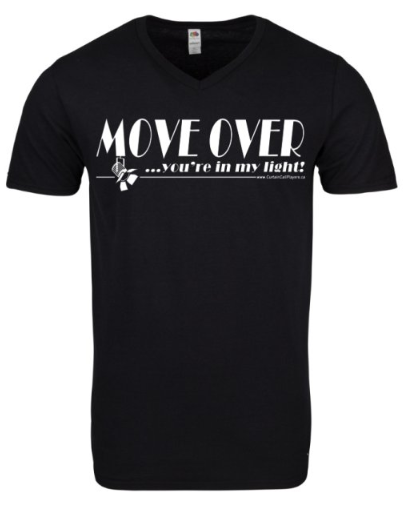 MOVE OVER: The perfect shirt to help you get your point across. We've all been there, but it's fun to finally have the T-shirt say so. KEEP CALM: Acting calm until the lights go down is a moment most actors and crew can relate to. Then we go all crazy again once the curtain closes and house lights are up. 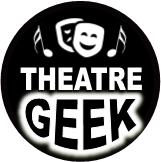 THEATRE GEEK pin: We know you know someone that would wear this pin with great pride. Wait a minute ...is it you? Us too! 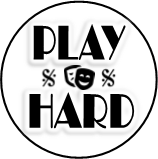 PLAY HARD pin: At CCP we "Play" Hard! Do you? We will send you one of these fun pins for a $10 contribution. 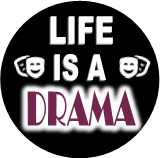 Life is a DRAMA pin: Tragedy and Comedy are like the yin and yang symbol of theatre. Life is a balance of both. 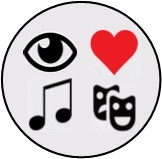 Eye Heart Musical Theatre: A fun pictogram telling the world you love Musical Theatre. It's the best - We totally agree! 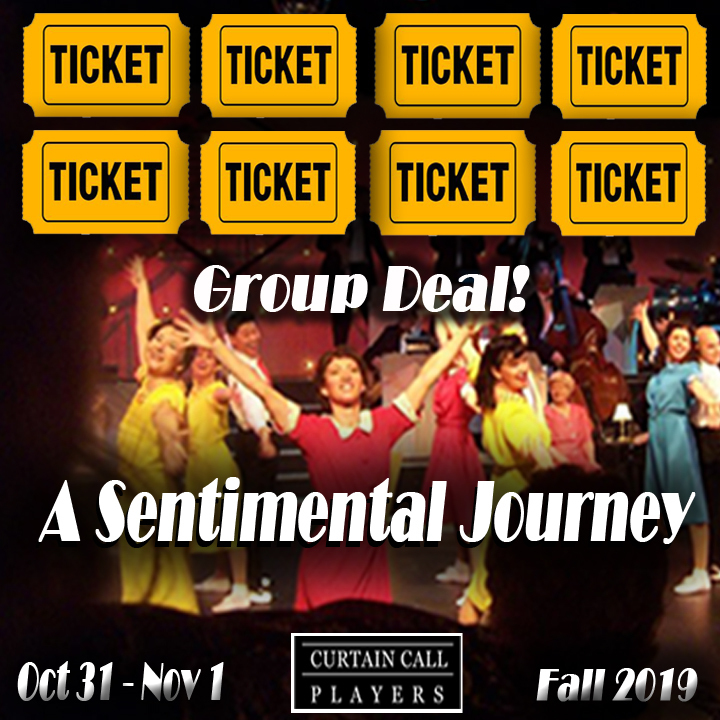 Thank you for being part of this wonderful 40-year journey with Curtain Call Players – together we can make this happen! We are grateful for your consideration to help us #SaveCCP. Whether you’ve been involved for one show or forty shows, on stage or in the audience, OR maybe we just met today, we are grateful for your support! Team #SaveCCP hasn't posted any updates yet. If you contribute $60, let us entertain you! It’s what we love to do. 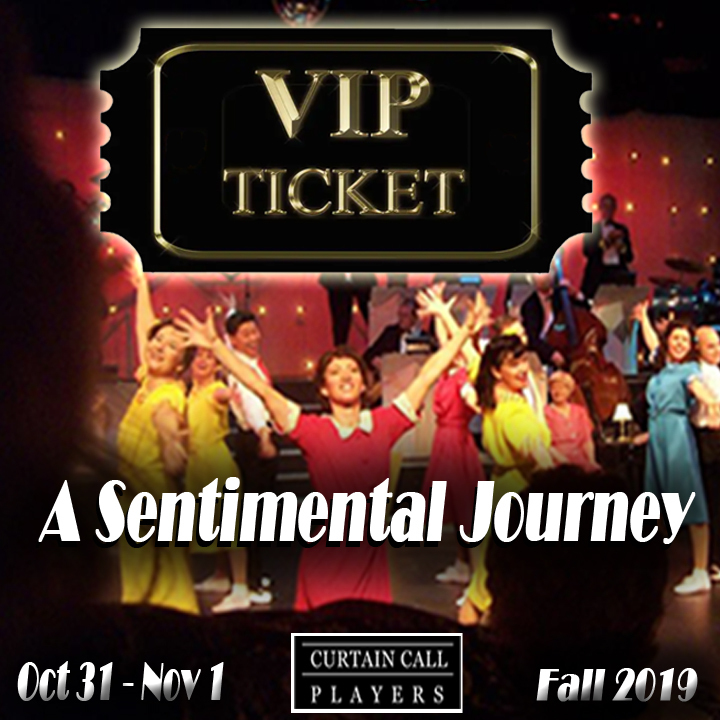 Enjoy One VIP ticket to A Sentimental Journey on our opening weekend (includes a healthy VIP snack and refreshment at intermission), plus a special VIP button and choice of 1 T-shirt. VIP ticket holders will be the first to have a code to them to choose their seats once we are successful with our crowdfunding. Showtimes will be October 31 - November 3, 2019. Please help us spread the word so you won't miss out on this amazing experience! Thank you! 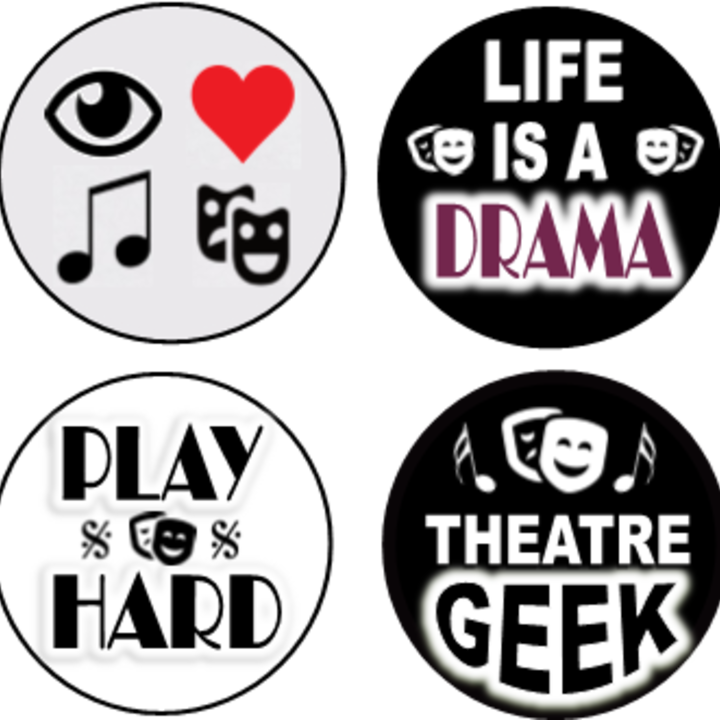 For your $10 contribution we would like to send you one of these funny theatre buttons we made. 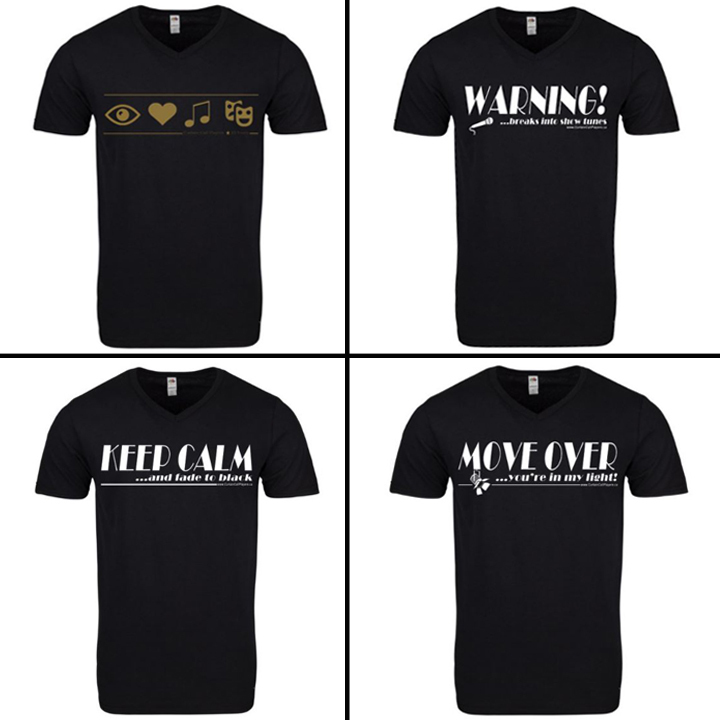 We hope you have as much fun with theseshirts as we had making them. We also hope you share our odd sense of theatrical humour. If you do, you're in the right place; pleased to meet you! If you contribute $30, prepare to be entertained this November. In addition to one ticket to A Sentimental Journey, we would like to offer you a complimentary Button of your choice. You will be sent a code to choose your seats as soon as we are successful with our crowdfunding. Showtimes will be October 31 - November 3, 2019. Please help us spread the word so you won't miss out on this amazing show! Thank you! If you contribute $80, you will receive 2 tickets to A Sentimental Journey on opening weekend, plus your choice of a T-shirt and 2 Buttons. You will receive a code to choose your seats once we are successful with our crowdfunding, and our VIP guest have been seated. Showtimes run October 31 - November 3, 2019. Note: There is no option available on Fundrazr to make selections on multiple items, so please tell us which buttons you'd like in the comment section at checkout. Thank you! 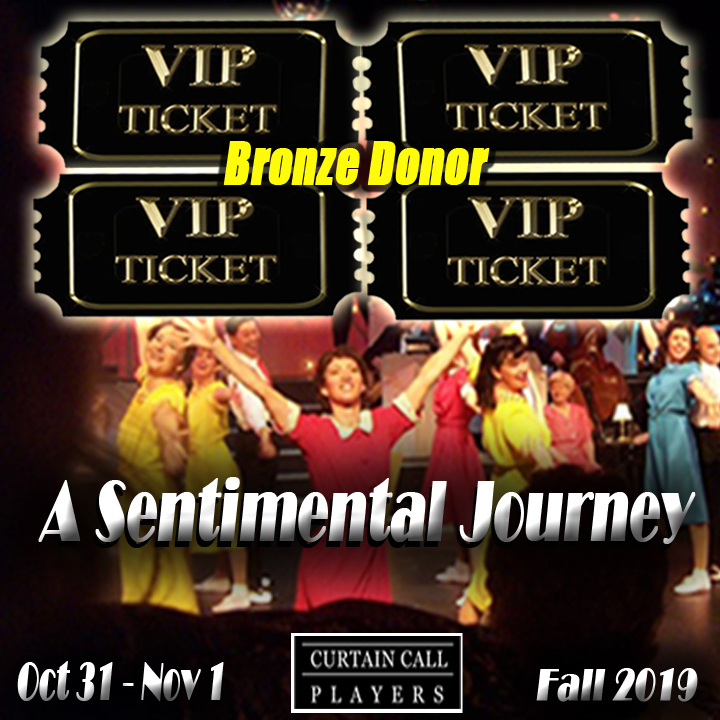 When contributing $100, you will receive 2 VIP tickets to A Sentimental Journey on opening weekend (includes healthy VIP snacks and refreshments at intermission), plus 2 VIP buttons AND a choice of one T-shirt. As VIP ticket holders, you will be the first to receive a code to choose your seats once we are successful with our crowdfunding. Showtimes run October 31 - November 3, 2019. 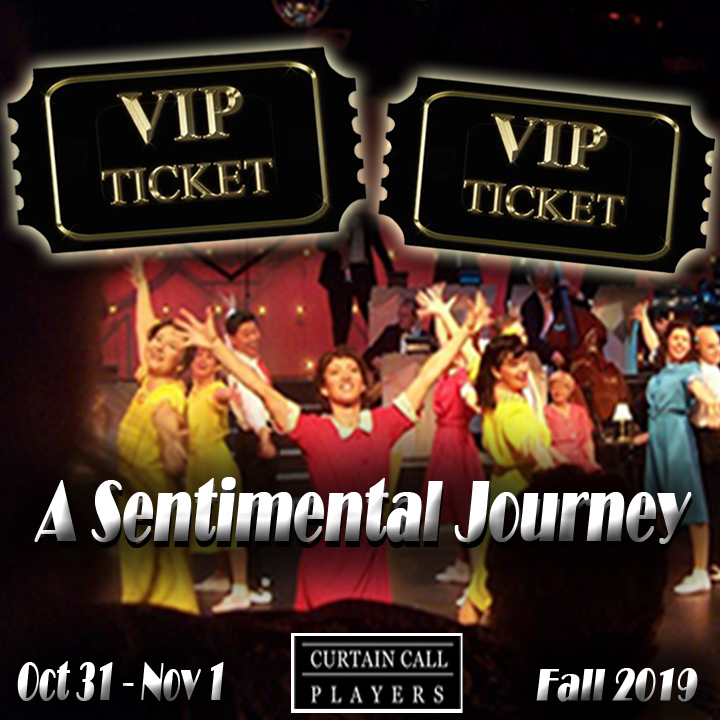 When contributing $160, you will receive 4 VIP tickets to A Sentimental Journey on opening weekend (includes healthy VIP snacks and refreshments at intermission), plus 2 VIP buttons. 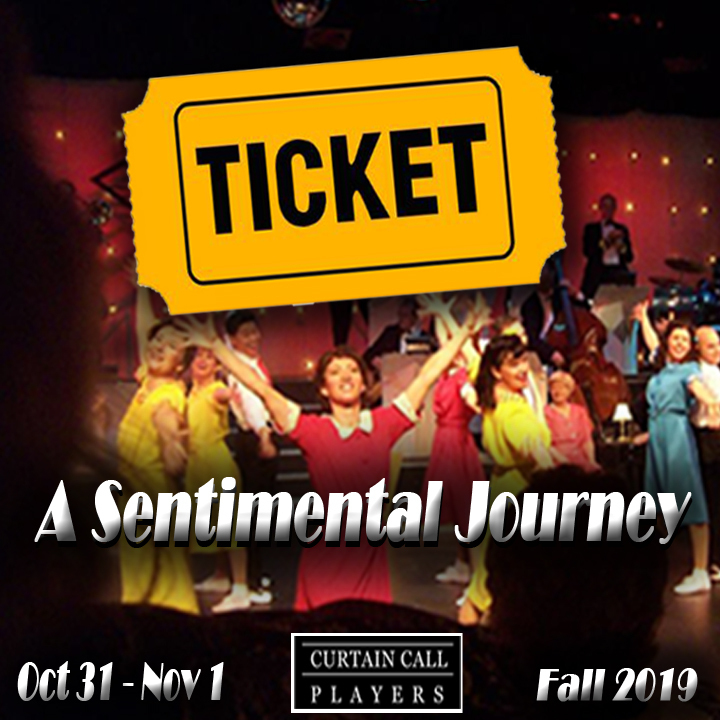 With a $200 contribution you will receive 8 tickets to A Sentimental Journey on opening weekend! If you’re after a deal this is it! Now you can bring your friends, too! 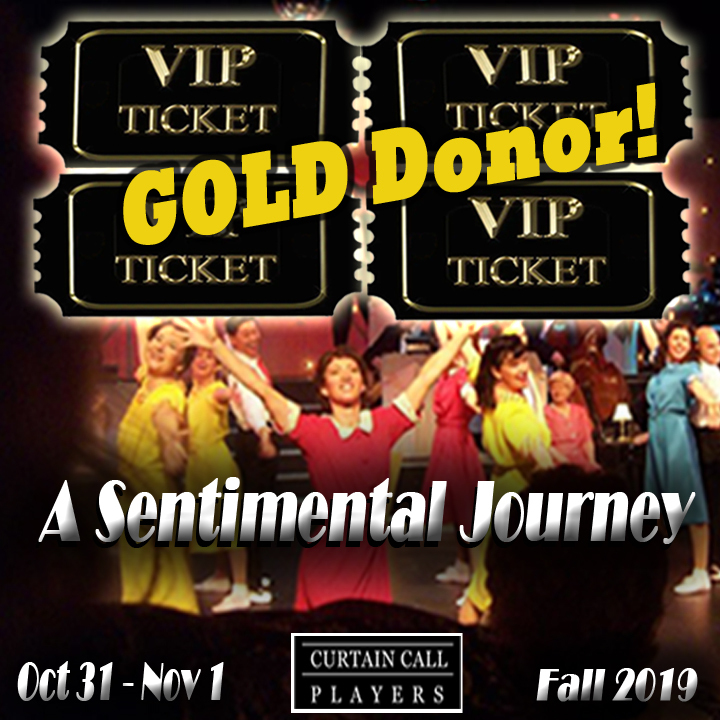 When contributing $250, you will receive 4 VIP Tickets to A Sentimental Journey on opening weekend (includes healthy VIP snacks and refreshments at intermission), plus 1 T-shirt and 4 VIP buttons. With this level you also become a CCP Bronze donor and will receive a charitable receipt for $70 in addition to your tickets and incentives. Your name will be listed in the programs at the show. As VIP ticket holders, you will be first to receive a code to choose your seats once we are successful with our crowdfunding. Showtimes run October 31 - November 3, 2019. 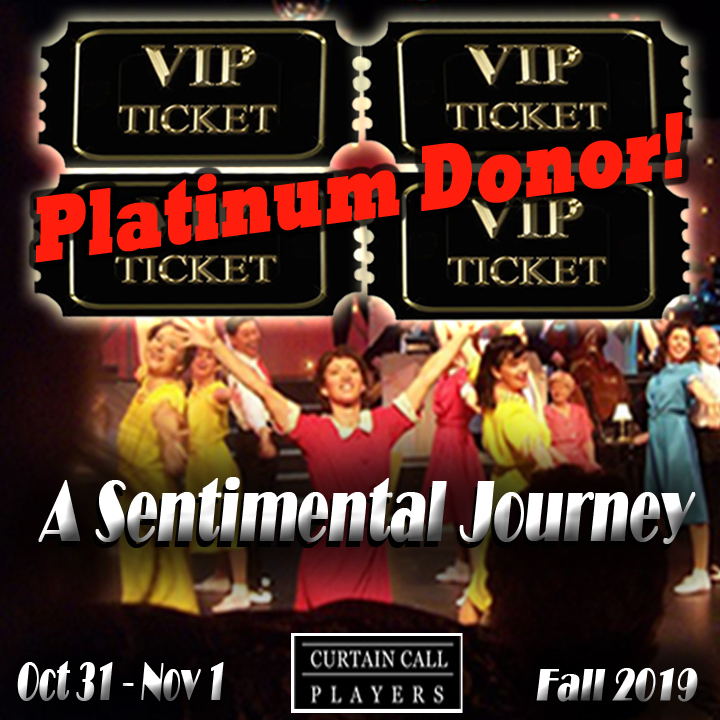 When contributing $500, you will receive 4 VIP Tickets to A Sentimental Journey on opening weekend (includes healthy VIP snacks and refreshments at intermission), plus 2 T-shirts and 4 VIP buttons. With this level you also become a CCP SILVER donor and will receive a charitable receipt for $300 in addition to your tickets and incentives. Your name will be listed in the programs at the show. Note: There is no option available on Fundrazr to select a second T-shirt so please leave your preference in the comment box upon checkout. Thanks you! 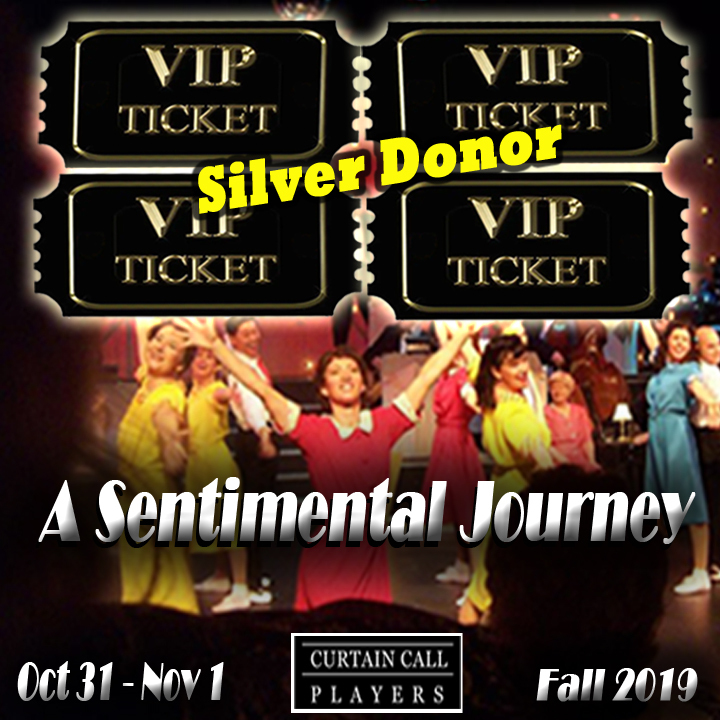 When contributing $750, you will receive 4 VIP Tickets to A Sentimental Journey on opening weekend (includes healthy VIP snacks and refreshments at intermission), plus 2 T-shirts and 4 VIP buttons. With this level you also become a CCP GOLD donor and will receive a charitable receipt for $550 in addition to your tickets and incentives. Your name will be listed in the programs at the show. You can even have a walk on role if you want! For $1000 you can be on the stage if you want! You may be in a stretcher but in the world of theatre, we still call this a walk-on role. 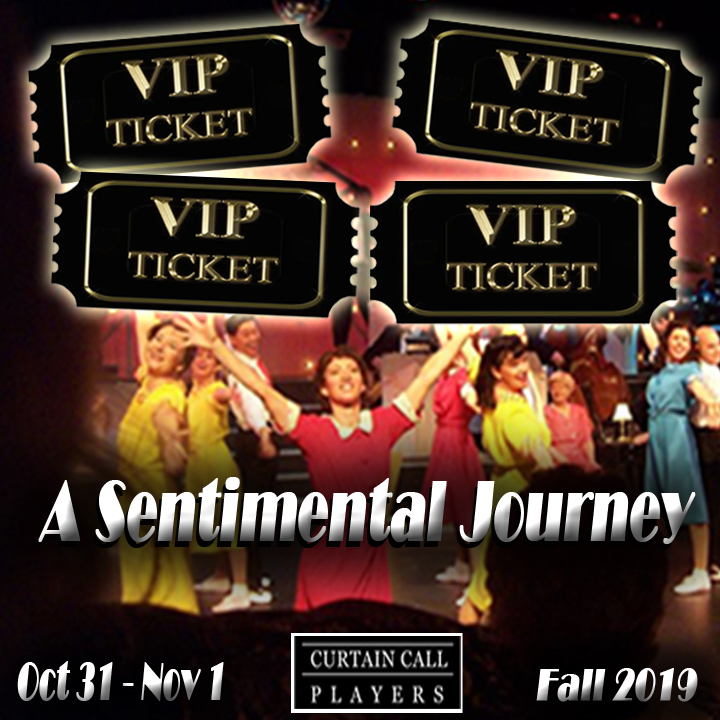 You will receive 4 VIP Tickets to A Sentimental Journey on opening weekend (includes healthy VIP snacks and refreshments at intermission), plus 4 T-shirts and 4 VIP buttons. With this level you also become a CCP PLATNIUM donor and will receive a charitable receipt for $760 in addition to your tickets and incentives. Your name will be listed in the programs at the show. 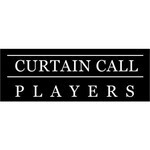 Curtain Call Players is managing the funds for this campaign.